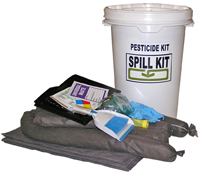 A spill kit for anyone who uses, transports or stores pesticides or herbicides. The 20 Gallon Pesticide Spill Kit in packaged within a 20 gallon Poly OverPack Drum. Drum is UN Rated, water-tight with a screw on/off lid. A refill kit is available. 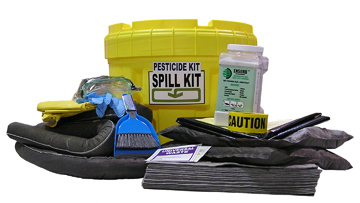 This Pesticide Spill Kit is designed to provides materials to meet regulations for hazardous pesticide spills as required by Dept of Agriculture, DOT, EPA and Board of Health. Useful to anyone who uses, transports, or stores pesticides. Shipping rates are estimates only and do not include fuel surcharges that change daily. Actual rate my vary.